Make six delicious french toast sticks in minutes with the new Deni French Toast Stick Maker. Save energy and time by using the Deni French Toast Stick Maker. It’s a great addition to any kitchen. Make breakfast or dessert in just minutes!. 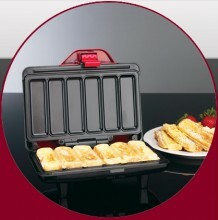 Turn two slices of bread into delicious French Toast sticks with this nonstick, compact device. 44-square-inches of cooking area divides two slices into six French Toast sticks, and power on indicator and ready light let you know when they are ready for eating. Can be stored vertically, with wrap-around cord. 700 watts. Makes 6 sticks in 5 minutes! Click the button below to add the French Toast Stick Maker Model to your wish list.